Mattress safety is an important aspect of baby protection in the baby nursery room. The crib is the one place that you will leave your young baby completely unattended. It's important that it be 150 percent safe. An ill-fitting, or soft baby crib mattress is one of the things that can compromise the well-being of your baby in her crib. Her head can become entrapped between the side of the crib and the mattress resulting in suffocation. The baby crib mattress should be firm with squared corners. Soft mattresses pose a suffocation hazard, and gaps between the corners of the mattress and the crib can cause your baby to become entrapped. The baby crib mattress should measure at least 27 1/4 inches by 51 5/8 inches. The depth should be no more than 6 inches. Babies can suffocate if they become wedged between the crib mattress and the sides of the crib. Remove all plastic covering. Never use plastic covering as a crib mattress protection. This poses a suffocation risk. Send in your product registration card so that you will be notified if your baby crib mattress is recalled. Always put baby to sleep on her back - this has been shown to dramatically reduce the risk of SIDS. Read about safe sleep practices for SIDS prevention here. Check out our crib recall page for the latest crib recall news including mattress and bedding recalls. Consider an organic crib mattress for increased peace of mind. Synthetic baby crib mattresses are not only made from low-quality materials such as PVC, polyester and foam but are typically coated with flame-retardant chemicals (PBDEs) that can compromise infant safety and health. These chemicals are now being considered as a possible cause of SIDS. For more details on crib mattress safety and health see Baby Crib Mattresses. Remember that crib mattress safety is only one small aspect of keeping your baby safe in the baby nursery. 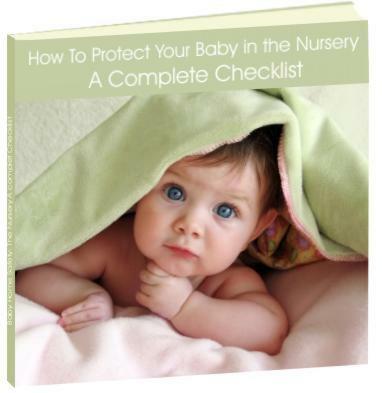 The best way to make sure you have everything covered is to use a nursery safety checklist when you are setting up your baby nursery. The above infant safety information is presented by Creative Baby Nursery Rooms for the purpose of educating mothers about baby crib mattress safety issues. We believe that the information provided on this site can help prevent baby crib accidents, however, an infant's safety is the responsibility of its caregiver alone.